Launched way back in early-2007, the SX4 sedan, which replaced the very capable Baleno, was put to a rather Herculean task – to spearhead Maruti’s charge in the premium car segment. 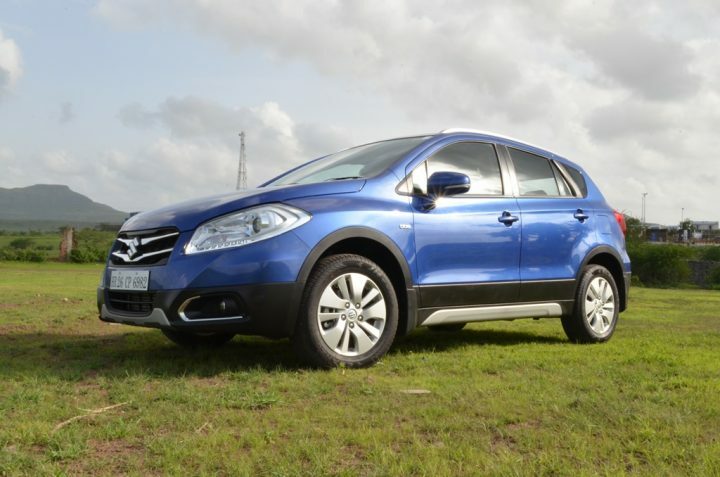 The SX4 sedan locked horns with the formidable Honda City, and much to Maruti’s dismay, failed rather miserably to entice the mid-size sedan buyers. With the Ciaz though, MSIL has finally put the ghosts of Baleno and SX4 to rest, and Maruti will soon launch ‘Nexa’ premium car brand to shed off its image of a small carmaker. 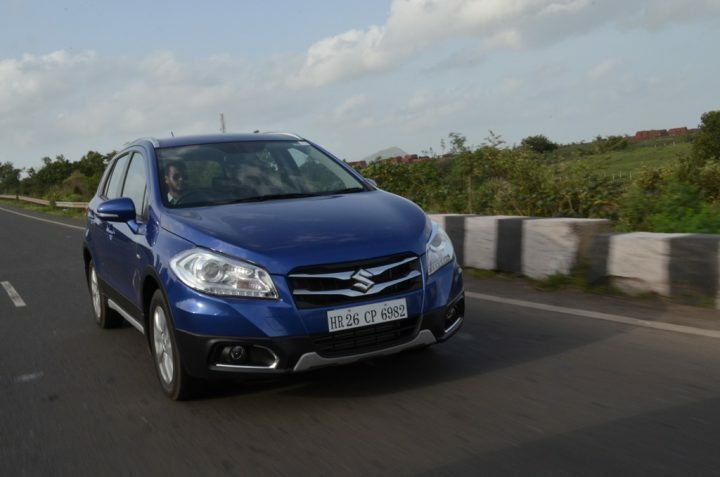 Also, Maruti is yet to give up on the SX4 and has been readying the car for its second innings, albeit in the original crossover guise. Dubbed as the S-Cross, the soon to be launched model will find itself positioned in the fast growing mid-size crossover segment, where it will rival the likes of Hyundai i20 Active, Volkswagen Cross Polo, Fiat Avventura and Toyota Etios Cross on one end, and the upcoming Hyundai Creta and the Renault Duster on other. Now, barring the Hyundai i20 Active, which has pushed the sales of new generation i20 to new heights, these pseudo crossovers have failed to tickle the taste buds of India’s car buying lot. However, Maruti is betting big on the new S-Cross, and in all probability, the upcoming crossover will be positioned slightly above the Ciaz. Also, the S-Cross will be sold under Nexa’s umbrella. We are just back from a short drive of the new Maruti crossover and here’s our Maruti Nexa S-Cross review and test drive report to give you a good idea about the new kid on the block. 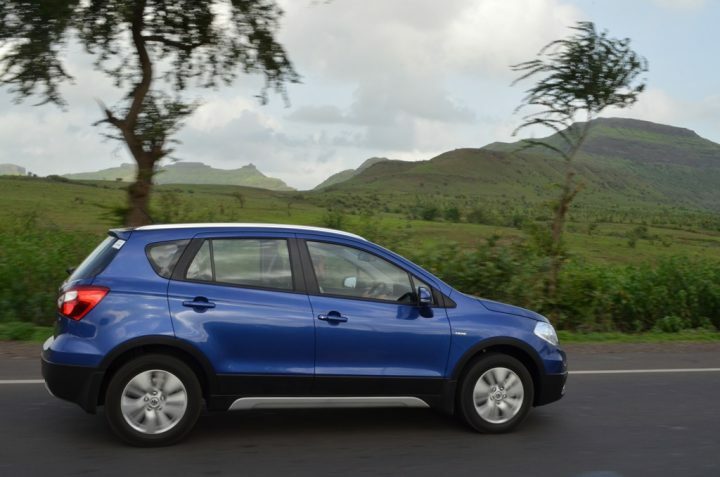 On the outside, the new Maruti S-Cross, much like almost all its rivals, looks like a hatchback on stilts. Highlight of the car’s front-end is a trapezoidal grille that plays a vital role in imparting a family look to the car’s nose. The upper-half of this grille boasts of twin chrome-plated horizontal slats, which is something that our country’s chrome-loving car buyers are likely to appreciate. The lower bumper boasts of plastic cladding and round fog lamps, which again get chrome highlights on the circumference. Adding a bit of aggression to the front is a faux skid plate and a bold character line that starts around the foglamps and goes on to flirt with the headlamps, before making its way to the car’s rear. Overall, the front-end design looks neat and pretty inoffensive. 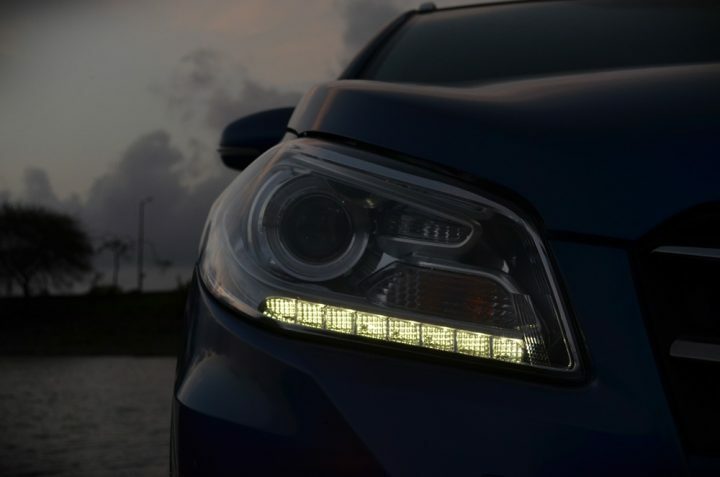 However, the headlamps look a tad oversized, especially in the variants that miss out on projector setup and DRLs. The side profile is where the S-Cross looks the most ‘SUV-ish’. While the designers have played it safe with the surface treatment, the aforementioned character line ensures that the car doesn’t look bland. As is the norm with such vehicles, the S-Cross gets silver-painted roof rails (top variant) and ORVMs that come with trafficators neatly integrated into them. There;s also plenty of plastic cladding, with silver-finished skid plates that run along most of the car’s wheelbase. The alloys, however, aren’t the most stylish and we would want MSIL to offer i20-like rims on the S-Cross. Playing a vital role in imparting this car with a rather aggressive stance is the 180 mm of ground clearance (for the record, the SX4 sedan offered 10 mm more). The rear is easily the most attractive part of this car’s design. The S-Cross’ posterior gets split taillamps that are slightly reminiscent of those on the EcoSport. The bumper is flanked by plastic cladding, which is in turn complimented by a faux skid plate and reflectors. As the S-Cross will be marketed as a ‘Nexa’ product, the manufacturer has refrained from using ‘Maruti’ badges. 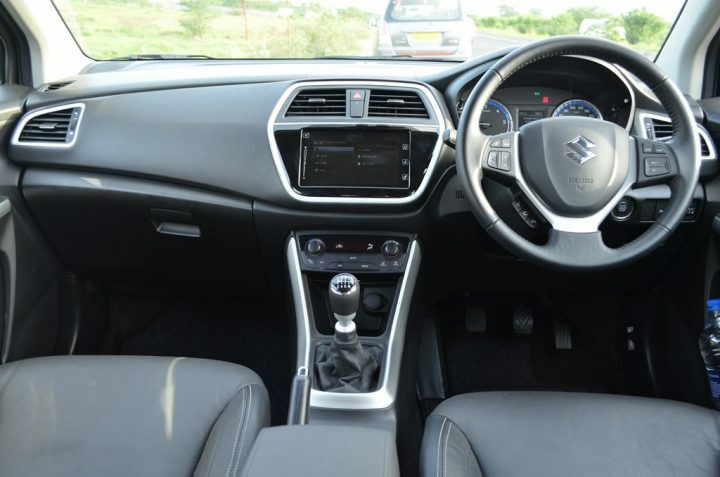 On the inside, the S-Cross gets an all- black theme with some tastefully executed silver highlights. The hexagonal-shaped centre console is home to a touchscreen infotainment system. 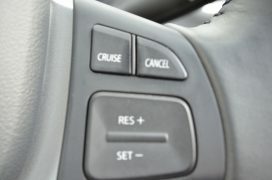 The steering wheel has been borrowed from the Swift and most of the knobs and switches come from the Maruti parts bin. The front row of seats offer good legroom and shoulder room and even at the back, two adults and a child can be comfortably accommodated. The car gets 365-litres of boot space, which can be extended to over 800-litres by folding the rear row of seats. Overall, the S-Cross pleases with its design. True, it certainly isn’t the most stylish car around, but like we’ve already said, the designers have played it safe, which basically means that the S-Cross won’t offend anyone with way it looks. Also, while the new car doesn’t look like traditional crossovers, it does manage to impress when seen as a stylish hatchback with hints of ruggedness. 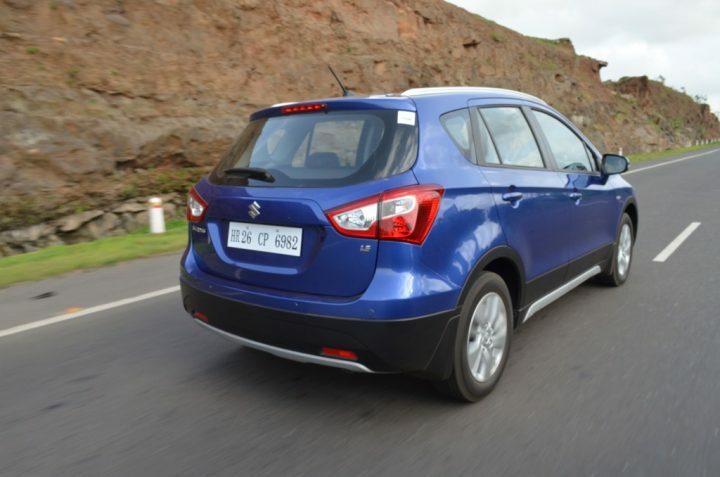 As we earlier reported, the Maruti S-Cross will go on sale in two diesel engine variants – 1.3-litre and 1.6 litre. Both these motors are sourced from Fiat and offer world class performance and fuel efficiency. The 1.3-litre engine here is the same turbo-diesel unit that earlier powered the SX4 Diesel and can be currently found in the Ertiga and the Ciaz. This motor, which has been christened as the DDiS 200, offers a maximum power-torque of 90 PS-200 Nm, and comes mated to a 5 Speed manual gearbox. On the other hand, the new 1.6-litre unit has been christened as the DDiS 320 and offers 120PS-320 Nm. This motor comes mated to a 6-speed manual gearbox. We drove the 1.6-litre variant and will restrict our views to this variant only. The new 1.6-litre engine offers high levels of performance and refinement. Keep the engine in the meat of its powerband and the S-Cross charges forward with ferocious velocity (To put things in perspective, the highly acclaimed 2.0 TDI motor from VW churns out exactly the same torque for the Octavia). The S-Cross loves to stretch its legs and it can easily cruise at highway speeds all day, without as much as breaking a sweat. 100 km/h in sixth gear comes at a rather leisurely 1700 rpm and the car can easily touch 170-180 km/h on the speedo. 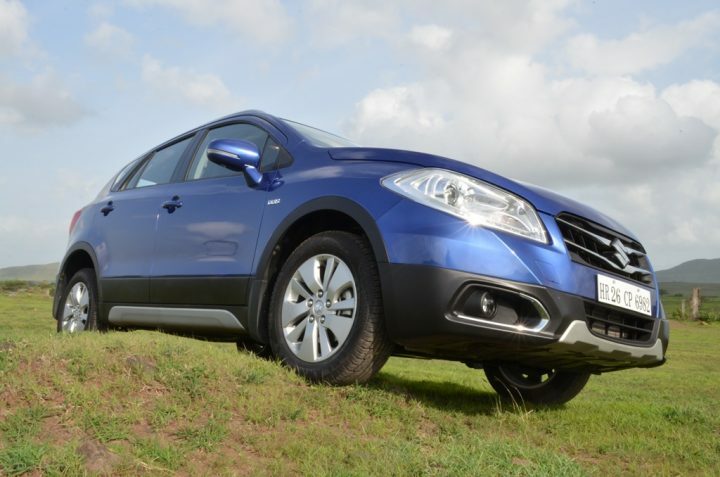 While we are pretty happy with the on-road performance of this car, there are some areas where the S-Cross can improve. For starters, the NVH levels aren’t too low and there’s considerable road noise and diesel clatter that filters into the cabin. More importantly, there’s a well-pronounced turbo lag below 1800 rpm and we wish the motor offered a linear torque delivery. The gearshifts are smooth though and the clutch action is light. The S-Cross pleases with its ride quality and the upcoming crossover can easily glide over most of the craters and undulations our roads are known to offer. However, the overall setup feels a bit stiff and the S-Cross doesn’t have the proverbial ‘magic carpet ride’. The S-Cross isn’t the best corner carving tool in its segment. For starters, there’s a hint of vagueness in the way the steering feels. Furthermore, there’s some body roll, which is, however, something that we always expected from a car in this segment. Not all’s lost though, for the steering does not feel too light and even the grip levels are adequate. And the high-speed stability is good too. The S-Cross gets ventilated disc brakes at front and solid discs at rear. The brakes have a good bite and are potent enough to haul down this car from high speeds. 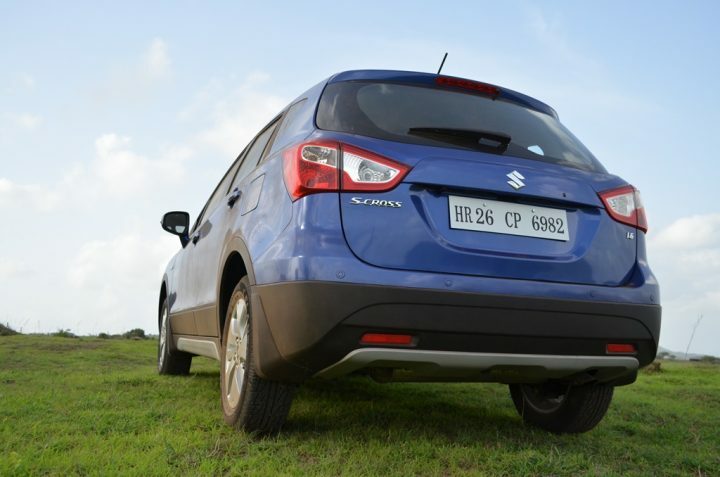 The Maruti S-Cross breaks no new grounds with its design, equipment list or even with the way it handles. However, there’s a lot going for the new S-Cross. For starters, the new 1.6-litre DDiS 320 engine boasts of high levels of refinement and is a punchy performer. 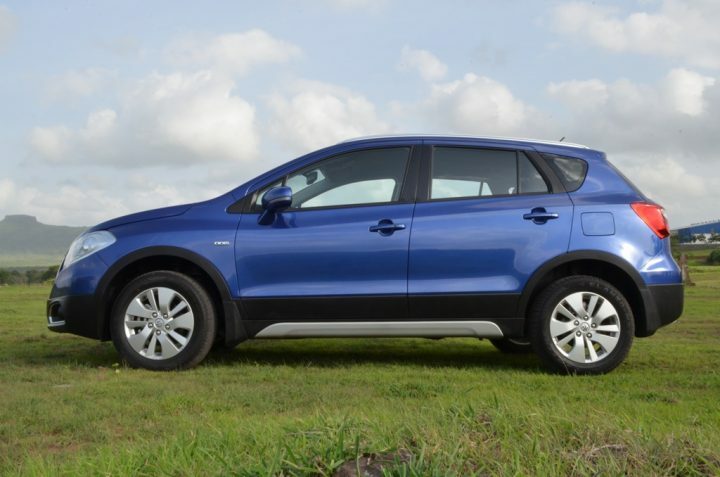 Furthermore, the new car offers a fantastic ride quality, good high-speed stability and a decent cabin. As aforementioned, Maruti will sell this car under the upcoming Nexa car brand and there are enough chances that the S-Cross will not suffer from the poor fate of its sedan sibling. That said, pricing would play a key role in the success of this pseudo-crossover and given that Maruti has almost always made it a point to price its cars ultra-competitively, the S-Cross could soon follow the footsteps of the Ciaz to become another popular premium model from the most successful ‘small carmaker’ of our country. Our sources have informed us that the new Maruti S-Cross launch will take place in early August and you can safely stay tuned to Car Blog India for full price list, variant-wise features list and more pics of the upcoming Maruti car in India 2015. 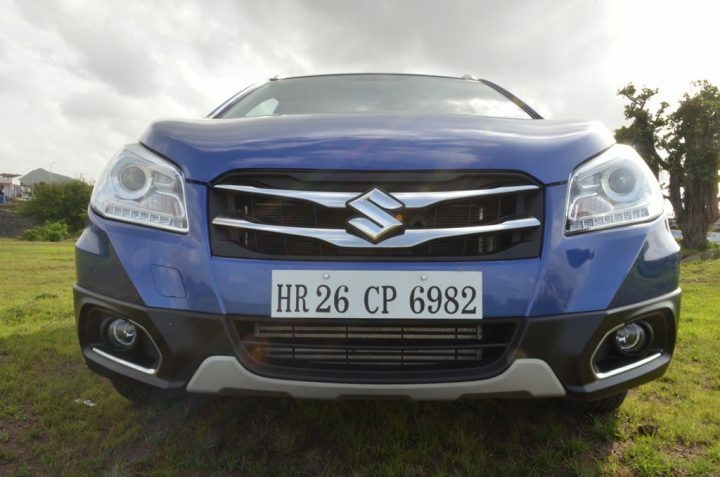 So, what do you feel about our Maruti Nexa S-Cross review and test drive report? Do let us know by penning down your thoughts in the comments section below.